Below you'll find my copy-pasted review of the above two models - since the Aquos Serie SHV34 is an exact replica of those, there's little point in writing a different review. Other than the completely character-lacking form factor, the new SHV34 is an impressive phone indeed. Just has way too much bezel on the top of its 5.3-inch full HD screen. Performance should be even better compared to previous models, thanks to the quad-core 64-bit Kryo Snapdragon 820 processor (MSM8996) built using the new 14 nm FinFET tech, with two 2.2 GHz cores and two 1.6 GHz cores, and the Adreno 530 graphics adapter whose processing capability includes 3D games as well. 3 GB RAM and 32 GB built-in storage, expandable to 200 GB using microSDXC cards should suffice perfectly. The Aquos Serie SHV34 comes with a newer and improved version of Emopa, version 4.0. Sharp are actually advertising it as an Artificial Intelligence smartphone. Unfortunately, all of this remains inaccessible to overseas fans who do not speak Japanese. 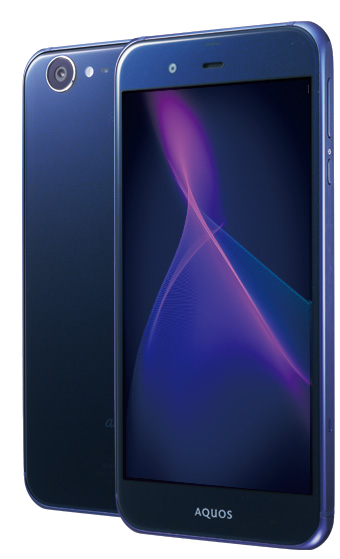 The Aquos Serie SHV34 comes with an improved UI thanks to further development of the Grip Magic sensors, now four of them – two on the sides and two on the back and front of the phone. Hold the phone and it will turn on when lifted. Since the fingerprint sensor is installed on the side of the body, you can unlock the phone just by holding it and have it ready to operate as soon as you lift it. Twist Magic allows you to twist the phone (rotate it about 90 degrees and back while holding it) to switch between working applications. An auto scroll feature has been added, too: you can start automatic scrolling of content by pressing your finger onto a dedicated icon. Also available is the Clip Now feature, previously only found on the Aquos Crystal models – slide your finger left to right on the top edge of the display to capture a screenshot. Further extras include the Feel UX, display-off when putting the phone in your pocket, sweep on, and Bright Keep – and Glove Mode – thanks to increased sensitivity of the touch panel, it can now be operated using gloves. Like earlier models, the SHV34 can play Hi-Fi music, including 24-bit WAV and FLAC files – Sharp recommend the Google Play Music app because their own built-in Music Player can't play such files. One tested, and IMHO better alternative to Google's, is AIMP Player for Anfroid. GSM: 1.9 GHz, 1.8 GHz, 900 MHz. AU are offering the Aquos Series SHV34 in navy, white, and coral pink. The pre-installed OS is Android 6.0. The Android 7.0 upgrade was released in March 2017. The upgrade to Android 8.0 rolled out on 5th April 2018.